From the Biddys collection by Westland Giftware. Biddys Astronaut Figurine. This Item is in stock and ready to ship. 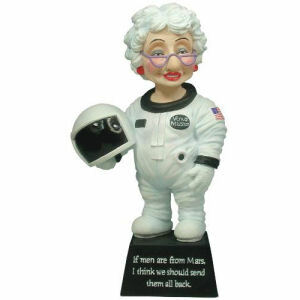 You should not postpone your purchase and miss out on adding Biddys Astronaut Figurine to your Biddys collection! From the Biddys collection by Westland Giftware. Biddy figurine titled Astronaut. Saying on base is If men are from Mars, I think we should send them all back. The perfect gift for that Over the Hill Little Old Biddy that you know and love.